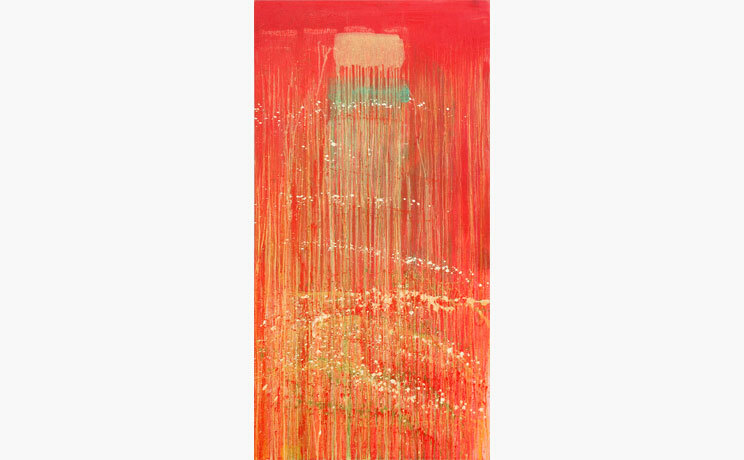 Pat Steir’s complex paintings, prints, and drawings encompass a lexicon of marks and signs. She rejected traditional forms of composition in favor of seemingly unrelated shapes and forms. Her works are combinations of random brushstrokes, grid lines, color charts, signs, color fields, and pictorial elements to create canvases that display a self-conscious symbolism. 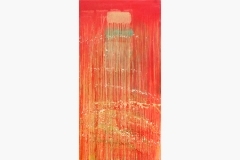 Drips of paint in the works can refer to the actual process of painting. Within her works there is no fixed meaning, as the artist allows her viewers to drawn their own inferences based on their personal history and associations. Her work is included in many public collections including Museum of Modern Art, New York, NY; Tate Gallery, London, England; San Francisco Museum of Fine Arts, San Francisco, CA; Walker Art Center, Minneapolis, MN; Metropolitan Museum of Art, New York, NY; Whitney Museum of American Art, New York, NY; and National Gallery of Art, Washington, D.C.. Pat Steir’s work continues to win her recognition and wide-acclaim. 2011 Modern Lab: The Found Alphabet, National Gallery of Art, Washington, D.C.
On an eventful day in 1988, Pat Steir found herself pouring delicate layers of white paint onto canvas. It was from that point onward that Steir decided her paintings would make themselves, focusing on the record of a process rather than a calculated result. She has become known for her ability to embrace the serendipitous nature of paint and gravity.